TORONTO - Finding a quality leadoff option has been a problem for many a Toronto Blue Jays manager, not just Charlie Montoyo. In a year where the losses are expected to easily outnumber the wins, lineup construction should be the least of Montoyo’s worries, but the new Jays skipper still has to write out his lineup card 162 times and someone has to be pencilled into the leadoff spot on a daily basis. In 2018, John Gibbons used 13 different leadoff hitters. Devon Travis, Steve Pearce, Curtis Granderson, Lourdes Gurriel Jr., Teoscar Hernandez, Dwight Smith Jr., Yangervis Solarte, Kevin Pillar, Russell Martin, Jon Berti, Jonathan Davis, Randal Grichuk and Billy McKinney all got at least one turn atop the lineup. Heading into opening day next Thursday against the Detroit Tigers, Montoyo has settled on two names to set the table in the early going: McKinney, who led off 24 times after coming over from the New York Yankees in the J.A. Happ trade, and Grichuk, who did it 15 times in 2018. Neither is prototypical, even if baseball prototypes are as fluid as ever. In 98 plate appearances out of the leadoff spot in his rookie season, the left-handed hitting McKinney slashed .247/.306/.416 with three home runs. The owner of a .348 on-base percentage and 21 steals in 35 tries across 618 minor-league games, McKinney’s profile doesn’t scream leadoff hitter, but neither does Grichuk’s, evidenced by a career on-base percentage of .298. But these are the options Montoyo has to work with, a group that was whittled down to two after Devon Travis’ latest knee surgery, which has the 28-year-old second baseman facing an uphill battle to regain his roster spot, let alone the leadoff job, when he works his way back into game action in May. While who’s hitting leadoff matters little in the grand scheme of things at this point, it will once the Ross Atkins/Mark Shapiro rebuild turns the corner, and the future of the leadoff spot may have been returned to minor-league camp Monday afternoon. There’s no question Bo Bichette turned heads this spring, slashing a robust .417/.475/.833 with four home runs and two stolen bases, generally showing to everyone that the power is coming along and he’s close to big-league ready with the stick. In the Mookie Betts mould, Bichette could be a dynamic power/speed combo atop the lineup in the coming years, but one also capable of sliding down into a run producing spot if other options arrive. An idea hatched by the veteran players in camp this spring, a strict pre-game clubhouse video game policy will be in place this season. Montoyo revealed the change Monday, with a couple of veterans saying they’ll police it themselves over the course of the season. The new manager noted that some players had mentioned it being an issue last year; a point one front office official had already made over the winter when it came to now-traded catcher Russell Martin. Martin’s inactivity in the second half gave the veteran a ton of downtime, and some inside the organization weren’t happy with the way he used that time, as various youngsters arrived in the clubhouse for the first time to strategy and game-planning sessions that involved Fortnite rather than baseball. Martin was far from alone, but it’s clear the laid-back Gibbons clubhouse model is changing. “That's not my rule, that's our clubhouse rule,” Montoyo told reporters. CAN POMPEY SURVIVE FINAL CUTS? Despite cooling off over the past week, no position player did more to help himself this spring than Anthony Alford. After a disappointing 2018 season at Triple-A, Alford started reworking his swing over the winter, showing some extra pop this spring with four homers in 33 Grapefruit League at-bats. While there is still work to be done in terms of the moving parts in his swing and the approach, no one is ready to give up on the toolsy 24-year-old and this spring Alford provided a glimmer of hope that he can put things together. The next step is continued health and a strong start with the Buffalo Bisons, which would have him on track to play a role in Toronto this summer when a spot inevitably opens up. 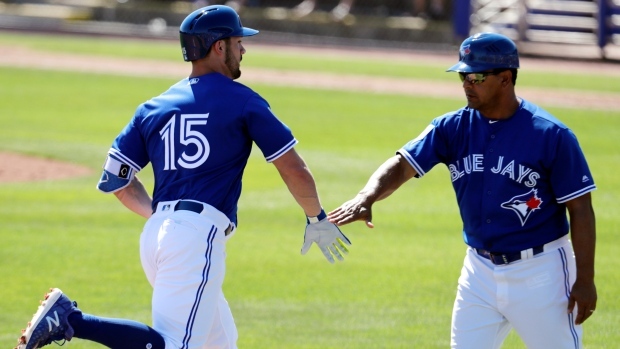 Alford’s demotion leaves Dalton Pompey battling to force Montoyo into carrying a fifth outfielder to start the season, a scenario that isn’t likely or ideal, but would be needed in order to protect the out-of-options Mississauga, Ont., product from being claimed on waivers. As a speed-and-defence option off the bench, Pompey’s skillset and potential upside makes a claim by a bottom feeder more likely than not. Pompey has enjoyed a solid, if unspectacular, spring, slashing .297/.297/.459 with four extra-base hits and a pair of stolen bases, but he’s also struck out 11 times in 37 at-bats and hasn’t walked. With Grichuk, Pillar, Hernandez and McKinney all roster locks, carrying a fifth outfielder would mean only seven bullpen arms breaking camp and heading north for next week’s four-game series with the Detroit Tigers. Speaking of the bullpen, that group is starting to take shape. Ken Giles is the closer. Ryan Tepera, Bud Norris and Tim Mayza are the setup group. Joe Biagini, who has been told by Montoyo that he’s made the team, is the fifth bullpen lock. Veteran John Axford and Rule 5 pick Elvis Luciano will likely be included to start the season, but the fact Axford and Norris both have to be added to the 40-man roster complicates things a little bit. If the Blue Jays front office deems Pompey as too intriguing to be exposed to waivers, there’s your seven ‘pen arms. The eighth arm would likely belong to Sam Gaviglio, who has enjoyed a tremendous spring with a 1.29 ERA and only seven hits allowed in 14 innings, but he can be optioned to Triple-A without consequence to start the year. As expected, the tandem doing the catching this season for the Jays will be Danny Jansen and Luke Maile. That situation was made official Tuesday when 24-year-old catcher Reese McGuire was sent to minor-league camp, paving the way for him to get full-time at-bats at Triple-A. It’s a good scenario for Montoyo and the Jays. Jansen is expected to play the vast majority of the time — around 110 games would be ideal — with Maile playing the role of defensively capable veteran caddy. One year after sharing at-bats in Buffalo with Jansen, McGuire can head back down the QEW to continue his development, at the same time giving the organization’s Triple-A rotation depth a catcher with a solid defensive reputation to work with. Brazilian pitching prospect Eric Pardinho’s sophomore professional season is currently on hold. After posting a 2.88 ERA as a 17-year-old in the Appalachian League last summer — he was almost four years younger than the average age of the circuit — Pardinho showed up on a couple of top 100 prospect lists this winter, but that hype train is now on hold after he began experiencing right elbow soreness this spring. Blue Jays director of player development Gil Kim confirmed Monday that Pardinho is currently in a holding pattern, although the team is optimistic it’s only a minor speed bump and not a precursor to something more serious. Young right-hander T.J. Zeuch, shut down in February with a lat strain, is also progressing very slowly and is currently without a target date for a return to action.